Is your youngster a designer at heart? Read on! 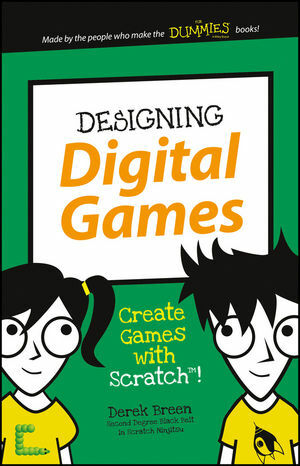 Designing Digital Games helps children apply their design skills to video game design using Scratch—and this book! Introducing simple programming concepts over the course of three easy-to-follow projects, it shows your child how to use the free Scratch platform to create a video game from the ground up. An extension of the trusted For Dummies brand, this juvenile book has a focus on accomplishment and provides all the steps to help young readers learn basic programming concepts to complete cool projects. From using sprites to create a game with a digital pet snake to creating maze games and cloning sprites to create a fun, attack-style game, this approachable guide offers simple, friendly instruction while building kids' confidence in designing digital games. If there's a kid aged 7-11 in your life who has an interest in using Scratch to design digital games, this book provides the building blocks they need to take their hobby to the next level.